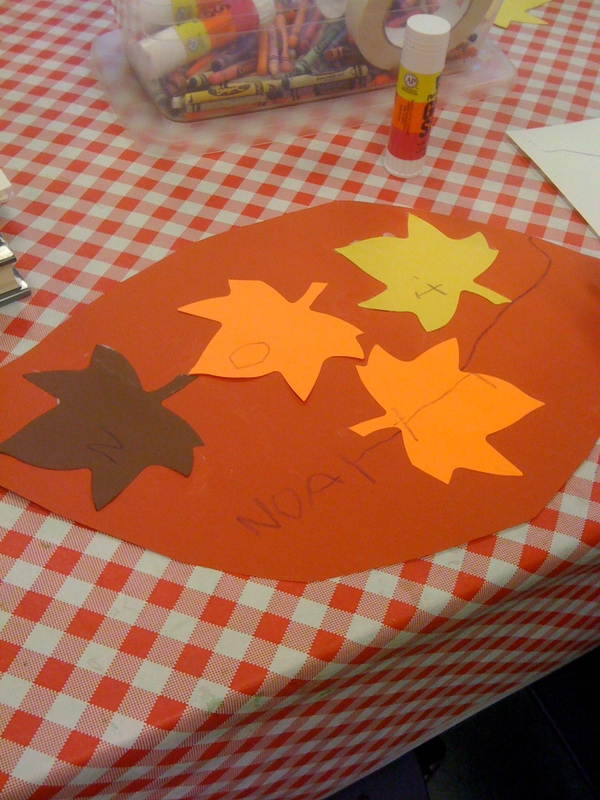 Yesterday was the first day of fall and so today we did a fall themed storytime! This storytime turned out to be much like the leaves storytime that I did last October. Now that I am looking back, the craft and the books are very similar. Generally I try not to do exactly the same thing, but sometimes it does happen. I guess it is a different group of kids each year and it’s been a while. The librarians who do the baby and two-year old storytimes will cycle through themes each year and refresh with new titles. What do you think? Do you have any opinions on having similar/repeating storytimes? Anyway, on to the storytime! First we read Leaf Trouble by Jonathan Emmett, illustrated by Caroline Church. This is a cute story about a squirrel, Pip, who is stressed out by all of the leaves falling off of his favorite tree. This is a sweet story, although it is a bit long. I read it first because I knew that my group would be the most fresh right away at the beginning rather than the end of storytime. Next we read Don’t Worry Bear by Greg Foley. Another cute story, this one features a little bear who is worried about his friend, Caterpillar, who has spun a cocoon. This one is not exactly about fall or leaves but it is a nice story about friends and the kids really enjoyed it. In fact, I had all of the books out for them to see and they requested it next! 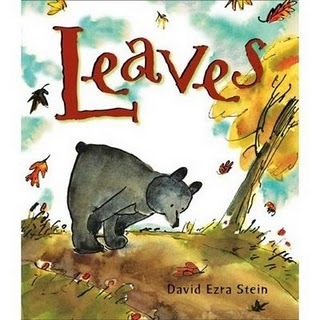 Finally, we finished with Leaves by David Ezra Stein. I really love this book, I used it last year and the year before that and had to use it again. There is something about the simplistic story and beautiful illustrations that make me really love this book. It’s such a simple but perfect way to discuss fall. The leaves on the trees come tumbling down all over town. the leaves on the ground go swish, swish, swish all through the town. We also did a fun flannel board activity. I put a tree up on the flannel board with lots of leaves and each child came up and pulled a leaf off and placed it in a pile at the bottom. This was a lot of fun for everyone. Finally, I can’t forget the craft! This was very simple but still very succesful. I think because of the use of glue sticks. 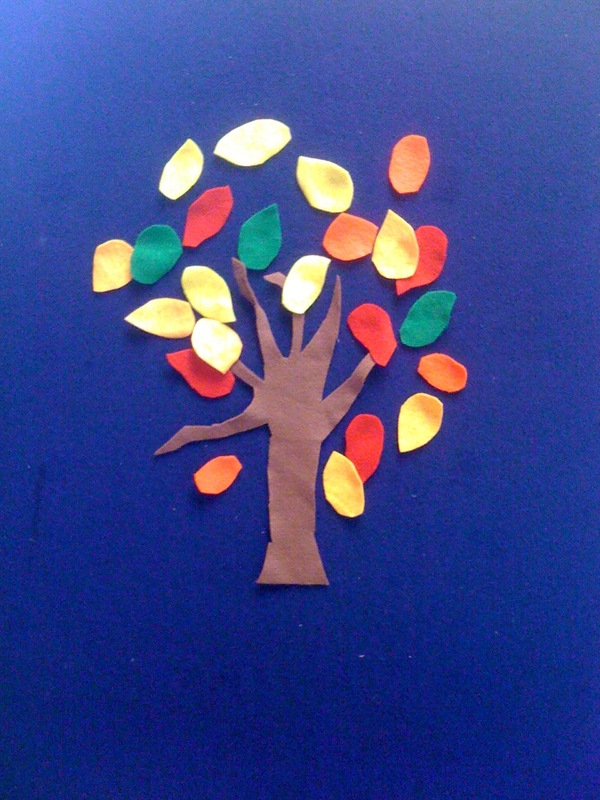 Using leaves from the dye cut machine, the children glued them onto a larger leaf and colored if they wanted. This age group loves to glue! They could have glued leaves all day long! at times I’ve done similar, and on occasion, almost exactly the same as the year before. The kids don’t mind the same stories because they are empowered that they know what happens, but they don’t like having the same (or sort of the same) craft. Change up on the craft is important to my group of storytime kids. I think you are right. The kids seem to get a kick out of the repetition. But as far as the craft goes my kids like something new. I think their parents like it too. Often the crafts will have similar elements but as long as its something different, no one seems to mind. I find that sometimes they INSIST on repetition. I am not allowed to change up the Halloween stories and if I try to skip Ice Cream storytime in July they get really upset!